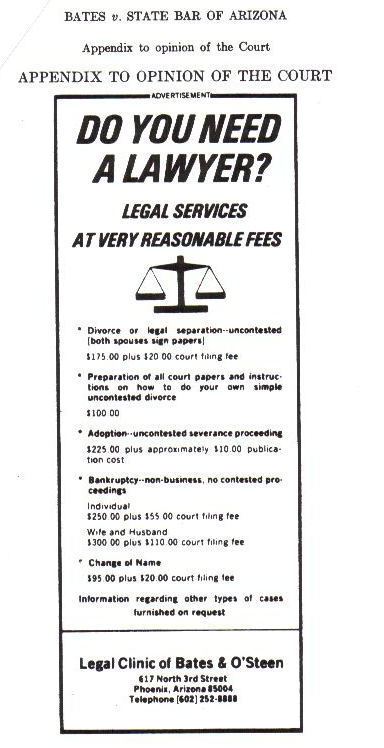 In 1974 John Bates and Van O'Steen left their jobs as legal aid attorneys to open up in Phoenix, Arizona, what they called a "legal clinic" for moderate income persons who did not qualify for government-funded legal aid. After two years, they concluded that their practice could not survive unless their low fees were advertised. They therefore placed the ad which appears to the right in the daily newspaper serving the Phoenix area, aware that in doing so they were violating Arizona Disciplinary Rule 2-101 which, like most state ethics rules at the time, prohibited any form of advertising. The President of the State Bar filed a complaint against Bates and O'Steen; the hearing panel recommended that each be suspended from the practice of law for six months. The State Bar Board of Governors, reviewing that recommendation, reduced the punishment to a one week suspension. The Supreme Court of Arizona upheld the decision, although reducing the punishment to censure only, recognizing that the lawyers were attempting to make a good-faith challenge to the constitutionality of the ban on advertising. Reversing the Arizona Supreme Court, the U.S. Supreme Court held that the First Amendment protected this exercise of commercial speech. A state may not "prevent the publication in a newspaper of ... [a] truthful advertisement concerning the availability and terms of routine legal service." 433 U.S. at 384.